Having a disability is not a curse. Teaching deaf children can be as challenging as teaching kids who have problems with their eyesight. 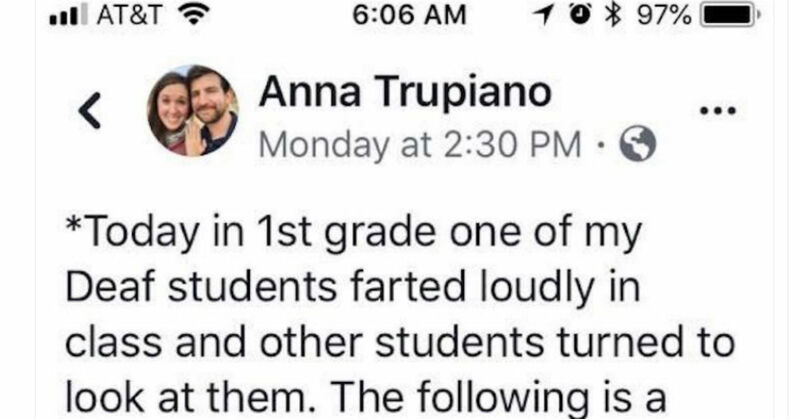 However, one teacher has a hilarious way of explaining to her students one incident that happened in the classroom – farting! Even with adults, farting is such a dreaded experience, especially if you are caught guilty! A similar incident happened on a first-grade student. That day, he and his classmates learned that passing gas is VERY audible even to the hearing world. Their teacher detailed her students’ hilarious conversation and shared it online which sent every reader in crazy fits of laughter! This post was shared by Anna Lind Thomas on Facebook. The clever teacher told him that Hearing kids can’t stop hearing farts because it just happens. The kid said, “I will stop farting then.” But the teacher was quick to explain to him that everyone farts and it is healthy to do so which is why he should not stop just because everyone would be able to hear it. He was shocked when the teacher then told him that even his mom, his dad, and everyone else farts. Mrs. Anna was laughing hysterically with her students by the end of this conversation. These innocent kids were blown away by the fact that farts can ‘sometimes’ be loud enough for deaf people to hear. Our body is weird that way and sadly, we can’t do anything about it! Even these kids who have hearing problems find it hard to comprehend how on earth are they able to hear farts!